The one you use everyday, that is. Well, in theory, at least. Even though many of us use the garage to enter and exit our homes, the 'formal' entry is of significant importance in terms of architectural design and aesthetics. It's where the user has direct interaction with the building envelope, enabling a tactile relationship with exterior form and material before entering. Careful consideration should be given to this transitional space, since it provides your visitor with a first impression shaping one's experience of the spaces that follow. We've been working on a remodel that includes exterior renovations, with a particular focus on redesigning the main entry. 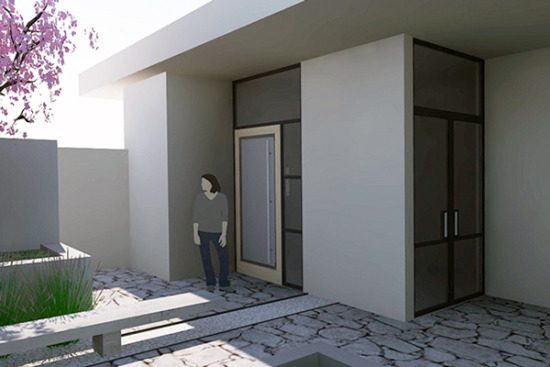 In the rendering above, the entrance is clearly defined with a custom pivot door, creating asymmetry and distinguishing it from the double doors at the side entrance. Additionally, we're creating an informal gathering space where there was once a built-in grill and counter. The space is defined by a linear natural stone bench located in a bed of gravel, beyond which California native grasses are proposed in order to create texture while still maintaining that sense of openness. The planter wall at the left will be clad in stone, breaking up the large expanses of stucco with a natural material. The rest of the exterior is receiving a new, smooth-trowel coat of stucco, and all bull-nose corners are being squared off, giving the entire home an updated and contemporary feel. Re-plastering an entire building is no small job, but there are alternative options to make an older home feel new. Small changes, such as adding masonry at low walls or replacing the front door- or even just the door hardware- are ways to make a statement without extensive remodeling. Consider installing new exterior light fixtures or replacing address numbers with stainless steel options.